The fundamental question of contemporary society is how to solve social problems. It is to consider to what extent, how intensely and on what principle, is it possible and necessary to distribute material assistance, services, and other tools and activities of social assistance, within social state policies, at all levels, in order to ensure a social balance, not to create social tensions, but rather individual, as well as society-wide, social satisfaction. Human reality is continuously changing. The problem with this process is to determine the variability of its causes and mechanisms, and in particular the effects of these changes. Today, we are trying to determine the context of social issues, through an analysis of the current social problems. The concept of a problem and a social problem, is generally used to describe a series of situations and behaviours considered to be social disorganisation, chaos, decay, but also as a reason for implementing the methods and means of transformation within the planned social change. The source of the creation and the existence of social problems are different aspects of social life, which are impeding on the rapid and effective satisfaction of basic needs. In this context, it is necessary to talk about the formation of a social reality through a social group. In the final analysis, the group educates the individual and gives him a note of “what is what”, what are the expectations for his behaviour, what is the truth, what is reality and what is fantasy and so on. 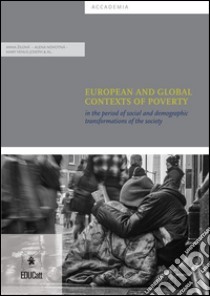 In relation to these processes, this monograph has been prepared, which reflects the emergence, progress or tendency of the development of a social reality in the area of European and global contexts of poverty, in a period of social and demographic transformations of society. In every society, poverty is more than a compunction, therefore, it is necessary to dig into the rich knowledge of social sciences, which help to be able to better understand what is happening in the current deep social change. With the objective of the informedness of the scientific community, but also as a tool of the application of theory into practice, we present you the scientific findings, opinions, polemics and discussions, but partly also a reflection of practical experiences on the given topic.